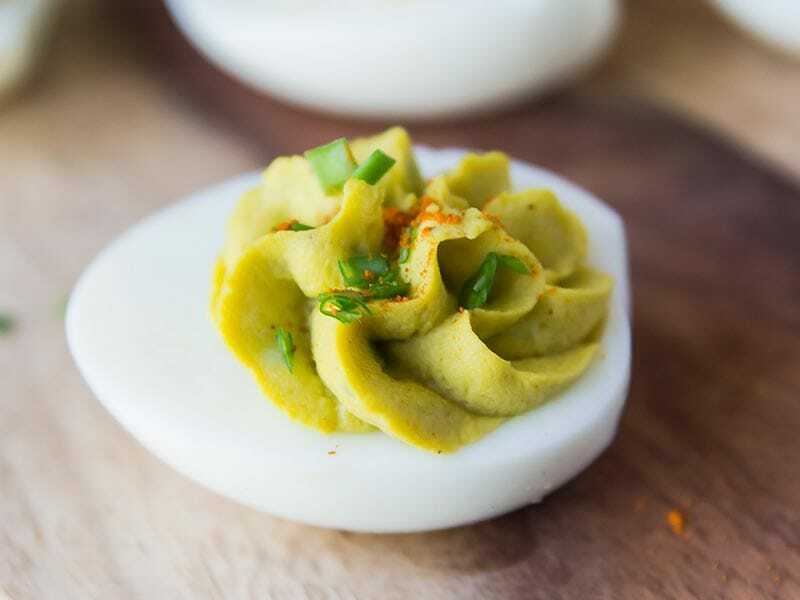 These healthy avocado deviled eggs without mayo are made with just a handful of wholesome ingredients! They make a delicious appetizer, especially around Easter time. Deviled eggs can be a pretty healthy and filling appetizer. They are especially great for Easter brunches. You can use the colored hard boiled Easter eggs that need using up. Usually the filling is made with a good amount of mayonnaise. I have nothing against homemade mayo or wholesome avocado oil mayo, but just the regular stuff made with GMO soybean oil and preservatives is not what I call health food. So for these healthy deviled eggs, I skipped the mayo altogether and used the flesh of ripe avocado instead. Avocado is called “Nature’s Mayo” for a reason. It is creamy and full of healthy fats, and does a great job at turning egg yolks into a delicious deviled egg filling. To start you need half a dozen hard boiled eggs. Or more if you choose to multiply the recipe. You can make hard boiled eggs on the stovetop by adding the eggs to a saucepan and covering them with cool water. Bring the water to a boil. Once boiling, set a timer for 6-7 minutes. Cooking the eggs on medium-high for 6-7 to minutes makes perfectly creamy hard boiled eggs without any green rings or still gooey yolks. You can also make hard boiled eggs in the Instant Pot. Find my Instant Pot Eggs Recipe Here! I recommend the Instant Pot method especially if you are planning to make a large batch of hard boiled eggs (say for Easter). It super easy, hands-off and the eggs are very easy to peel. 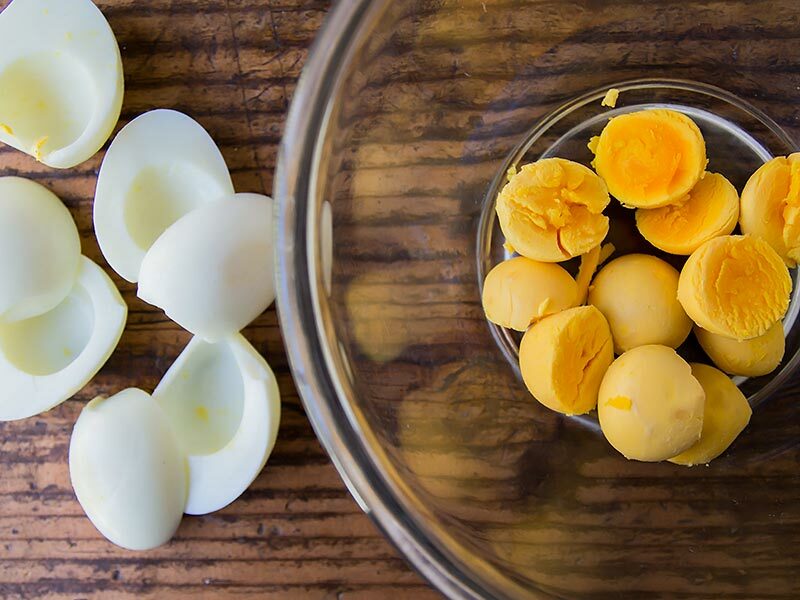 Once you have cooked and peeled the eggs, carefully cut each egg in half. Using a teaspoon or similar remove the yolk from the cooked egg whites and add the yolks to a bowl. 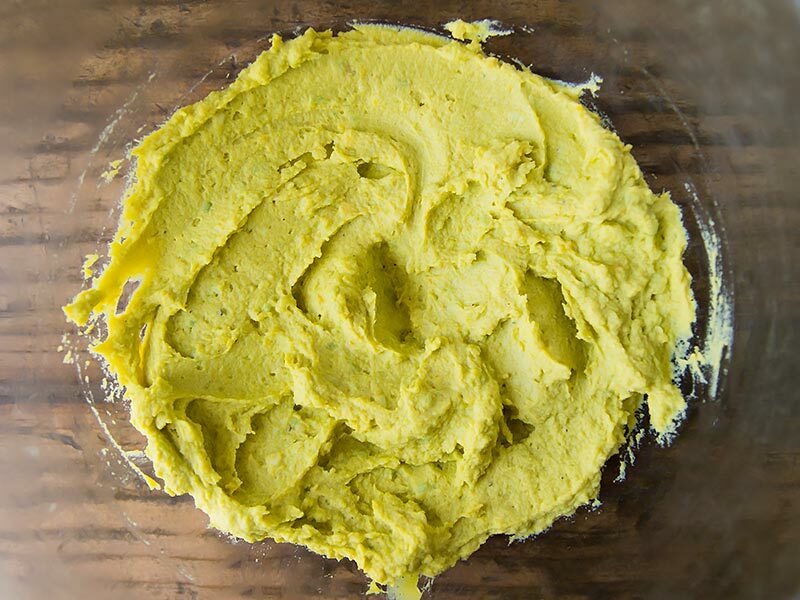 In a separate bowl prepare the avocado by mashing it very well into a fine puree without any big lumps. 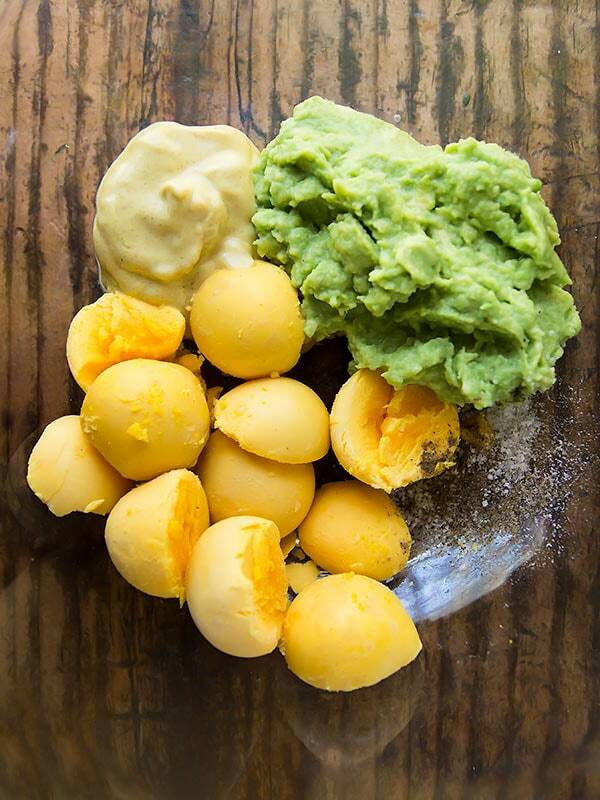 To the yolks, add the remaining filling ingredients: mashed avocado (to replace mayo), Dijon mustard, sea salt, and black pepper. Now mash together all ingredients for the deviled eggs. Use either a fork, a potato masher, or even a metal wire whisk. Everything should look smooth and uniform. Because of the avocado this will be a green deviled eggs filling. How to fill deviled eggs? I use a piping bag with a large star piping tip to add the filling to the egg whites. 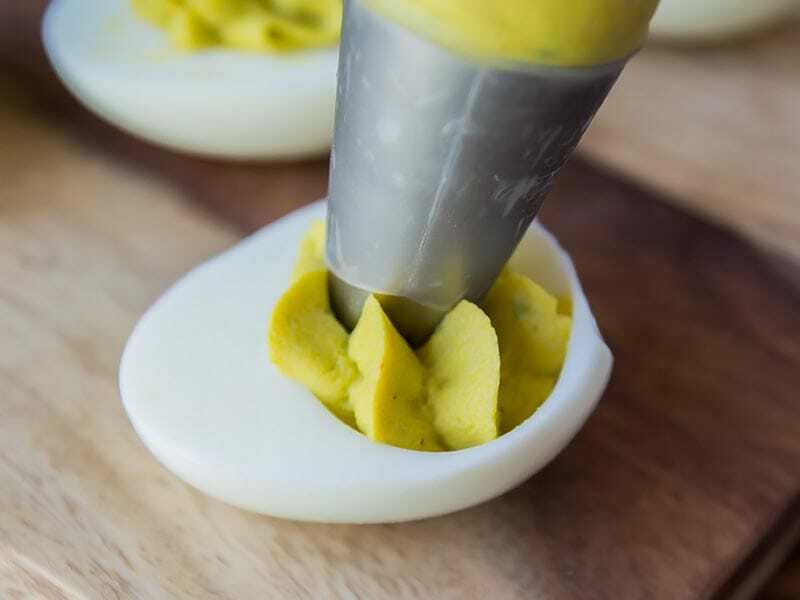 The piping tip will shape the deviled egg filling into a pretty swirl shape. But you can also just use a freezer bag with a corner cut off and pipe the filling that way. You could even carefully fill the egg white cavities with a small teaspoon. Place a cooked egg white down in front of you. Hold the piping bag tip over the cavity where the egg yolk used to be. Apply pressure to the bag to squeeze out the filling, while simultaneously moving the tip in a circular motion to create the swirl. Top each swirl with a touch of (smoked) paprika powder and sprinkle with a little chopped green onion or chive. Will Avocado Deviled Eggs Turn Brown? 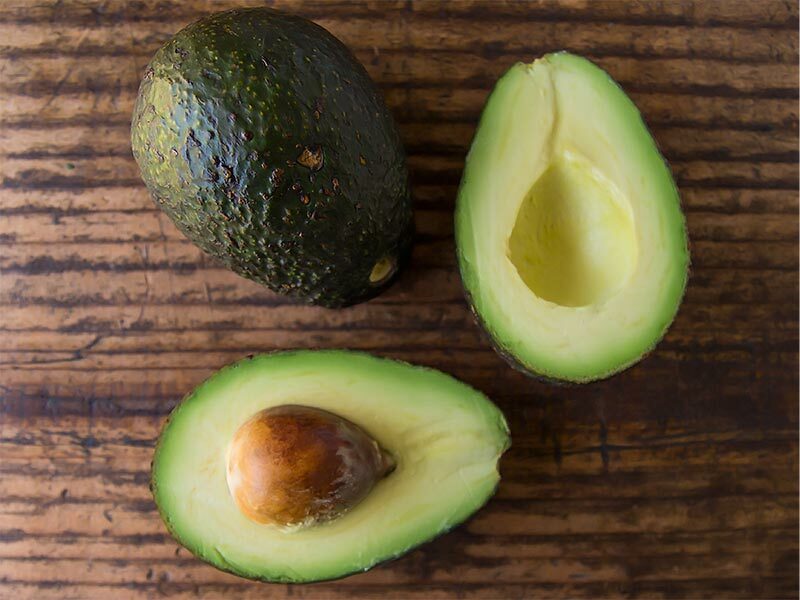 Avocado turns from its lovely shade of green to brownish when exposed to air. This is called oxidation. 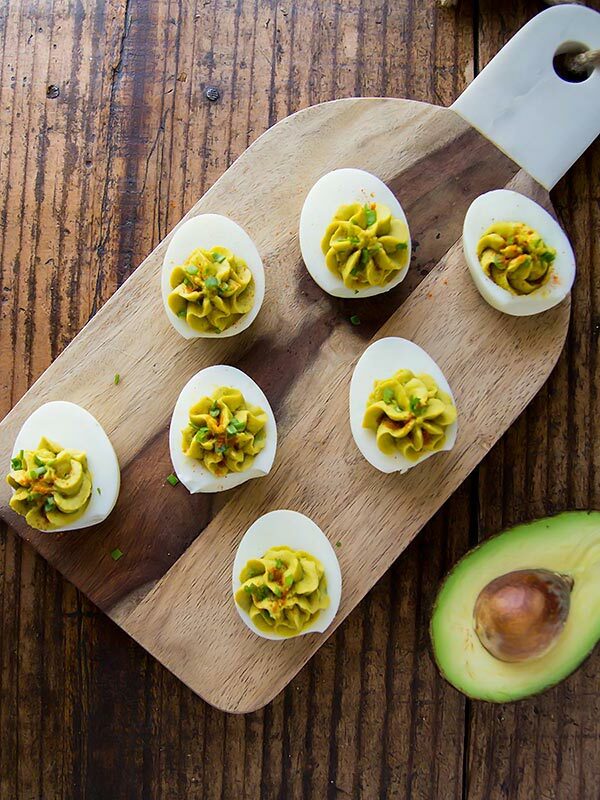 The same happens with dishes made with avocado, like guacamole and also these avocado deviled eggs. For that reason I recommend to pipe the filling into the egg whites as close to serving time as possible. (Keep the whites and the filling in the piping bag refrigerated until then). After filling, keep the healthy deviled eggs covered with cling wrap or a bowl cover to minimize their exposure to oxygen until ready to serve. For leftovers, keep in mind that the brown oxidation is only a visual impairment that doesn’t affect the flavor or food safety. It also affects only the very outside of the filling – the inside that isn’t exposed to air will keep its green colour. 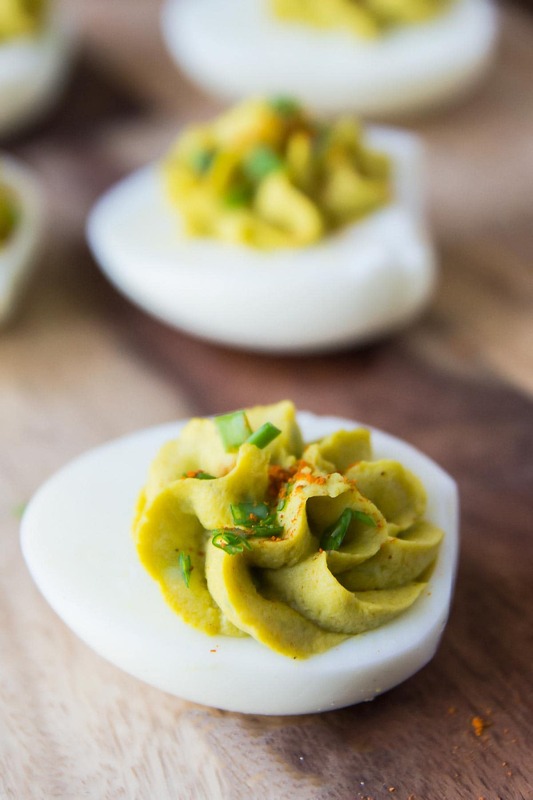 These avocado deviled eggs are safe to store refrigerated for 2-3 days. Just keep in mind the above point about the outside of the filling oxidizing and changing colour. Keep leftovers covered to minimize the oxidation effect. 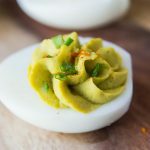 I used my Instant Pot to conveniently make a large batch of hard boiled eggs for these easy deviled eggs. This is Maille Dijon is my preferred mustard to use for the filling in this stuffed eggs recipe. I use this large star piping tip for piping the paleo deviled eggs filling into the egg whites. I also use it for many other dessert recipes. A sprinkling of Smoked Paprika gives these simple deviled eggs a delicious finishing touch. 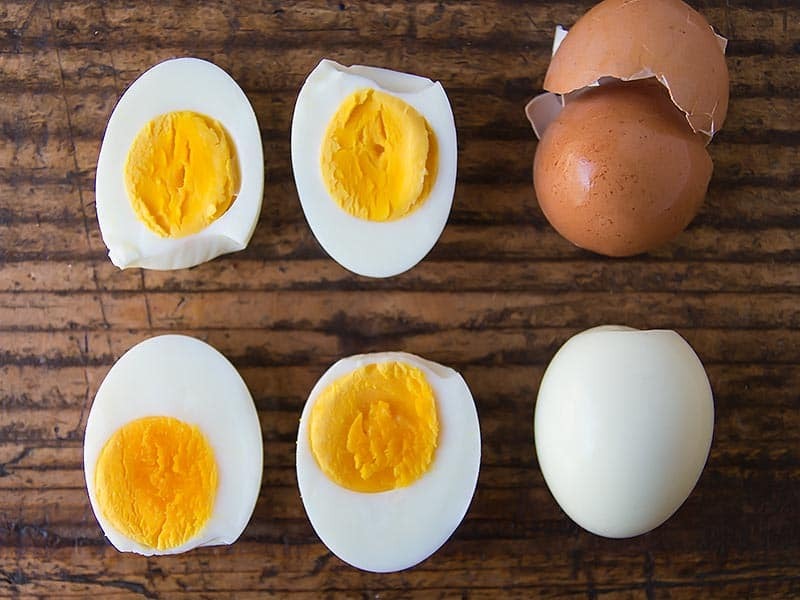 Peel the hard boiled eggs. This is easiest under running cool water. Using a large knife, cut the eggs in half lengthwise. Carefully separate the egg yolks from the whites and place the yolks in a large bowl. Mash the avocado flesh and add to the egg yolks in the bowl. Add Dijon mustard, sea salt and black pepper (to taste). Mash everything together with a fork or potato masher until smooth and fully combined. 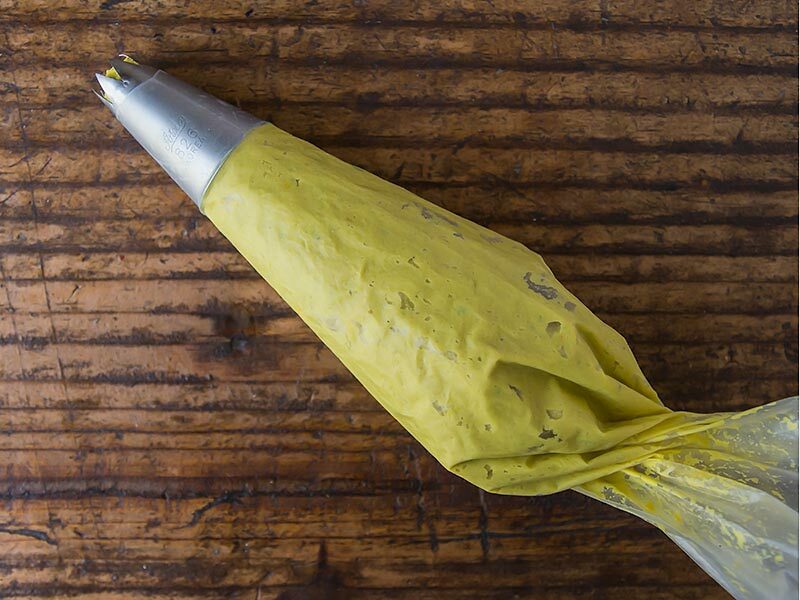 Fill the healthy deviled egg filling into a large piping bag fitted with a large star tip. Arrange the cooked egg white halves on a serving plate or board. Fill the cavities by piping the filling into it in a large swirl. Sprinkle with paprika powder and sliced green onion. Cover and serve within a few hours of preparing, before the avocado in the filling oxidizes and turns brown.